Jason in Atlantis is not your typical mythic hero. Don't believe us? 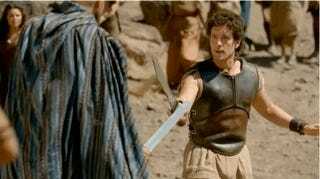 Check out the above gif, where his sword grip leaves a little bit to be desired. Poor guy. So yeah, Atlantis is basically your typical mythic portal fantasy — Jason is from 21st century Earth, but when he searches for his missing father in the ocean, he stumbles on a portal which whisks him to ancient legendy Greece, where he meets Hercules and Pythagoras. And it turns out that Jason is secretly someone awesome (probably a demigod) but mustn't know the truth about himself, and he has a huge epic destiny — which starts when he slays the Minotaur, who sadly does not demand Hymetusite at any point in the proceedings. None of this is particularly fresh or exciting — and the comparisons to the BBC's fellow legendy magic coming-of-age show Merlin are hard to ignore — but there are flashes of humor here and there, which remind you this is the work of Misfits creator Howard Overman. It's nowhere near as irreverent as Misfits, of course — but the fact that Jason doesn't just pick up a sword and automatically know how to wield it is refreshing. And so is the un-heroic, Falstaffian Hercules, and the random inclusion of Pythagoras. Whenever this show gets silly, one feels as though it's playing to its strengths, but it seems to be trying for a fairly earnest tone sprinkled with laughs. Oh, and Alexander Siddig as King Minos = Win. So good to see Dr. Basihir again. I only hope he lasts longer than he did in Doomsday.